1895—The battleship USS Texas is commissioned. She is the first American steel-hulled battleship. USS Texas serves off Cuba during the Spanish-American War and takes part in the Battle of Santiago. 1908—The first Navy Post Offices are opened on board Navy ships following a June 27, 1908 General Order 74 establishing them. 1944—Operation Dragoon begins, which is the Allied invasion of Southern France. Western Naval Task Force, commanded by Vice Adm. Henry K. Hewitt, USN, lands the Allied force on the front between Toulon and Cannes. 1953—Adm. Arthur W. Radford, USN, becomes the first naval officer to be appointed as the Chairman, Joints Chief of Staff, serving two-terms until Aug. 15, 1957. 1987—USNS Comfort (T-AH 20) is christened and launched in San Diego as a Mercy-class hospital ship following conversion from a San Clemente-class supertanker. She is the third Navy ship named Comfort. 1998—USS Bonhomme Richard (LHD 6) is commissioned at Pensacola, FL. The Wasp-class amphibious assault ship is the third to honor the frigate used by Capt. John Paul Jones during the American Revolution. Dominating national news headlines today is continued reporting on the primary season as voters took to the polls in serval states last night moving up to the November elections, and numerous reports on a grand jury document that states that more than 300 "predator priests" have been accused abuse in Pennsylvania. USNI News reports that a Marine who went missing from USS Essex last week has not been found as the Navy and Marines concluded a five-day search of the Sulu Sea, Mindanao Sea and the Surigao Strait covering an area of 13,000 square miles. Stars and Stripes reports that it will take scientists months to determine how many sets of Korean War remains were in the 55 boxes handed over by North Korea as the remains are in "moderate to poor" condition. Additionally, an official from Huntington Ingalls Industry said that in order to meet the requirement for 38 amphibs, the Navy should accelerate the production of its two newest class of amphibious ships to avoid creating a cold construction line and to lower costs reports USNI News. Constantinople falls to Michael VIII of Nicea and his army. John of Portugal defeats John of Castile at the Battle of Aljubarrota. Hugh O'Neill, the Earl of Tyrone, leads an Irish force to victory over the British at Battle of Yellow Ford. Frederick II defeats the Austrians at the Battle of Liegnitz. The Confederate raider Tallahassee captures six Federal ships off New England. The first ballot voting in England is conducted. The Panama Canal opens to traffic. American comedian and "cowboy philosopher" Will Rogers dies in an airplane accident, along with American aviation pioneer Wiley Post. The Japanese submarine I-25 departs Japan with a floatplane in its hold which will be assembled upon arriving off the West Coast of the United States, and used to bomb U.S. forests. American, British and French forces land on the southern coast of France, between Toulon and Cannes, in Operation Dragoon. Gasoline and fuel oil rationing ends in the United States. Britain grants independence to India and Pakistan. Two U.S. divisions are badly mauled by the North Korean Army at the Battle of the Bowling Alley in South Korea, which rages on for five more days. Over 400,000 young people attend a weekend of rock music at Woodstock, New York. US President Richard Nixon announces a 90-day freeze on wages and prices in an attempt to halt rapid inflation. Ignoring objections from President Ronald Reagan's Administration, US Senate approves economic sanctions against South Africa to protest that country's apartheid policies. US Social Security Administration, previously part of the Department of Health and Human Services, becomes an independent government agency. Infamous terrorist Carlos the Jackal captured in Khartoum, Sudan. Astronomers announce the first solar system discovered outside our own; two planets had been found orbiting a star in the Big Dipper. An earthquake of 8.0 magnitude kills over 500 and injures more than 1,000 in Peru. From Galloping Gates to the Gulf of Sidra by W. Thomas Smith Jr.
Franklin, who serves as the school's first superintendent, is destined to become an admiral in the Confederate Navy. "…the war situation has developed not necessarily to Japan's advantage, while the general trends of the world have all turned against her interests. The enemy, moreover, has begun to employ a new most cruel bomb, the power which to do damage is indeed incalculable, taking toll of many innocent lives. Should we continue to fight, it would only result in the ultimate collapse and obliteration of the Japanese nation … but would lead also to the total extinction of human civilization." Though the Americans will be decisively defeated at Camden – thanks to Gates' improperly positioning inexperienced militia against seasoned regiments of the regular British Army, as well as his complete loss of tactical control – the battle will prove to be something of a highwater mark for British forces in the southern colonies (after Camden, it's pretty much downhill for the British). Gates himself will break and run, earning him the nickname, "Galloping Gates." But the heroics of many of the ill-fated albeit last-standing Continental officers and men (like Gen. Johann Baron de Kalb) will prove to be exemplary. And Gen. George Washington – always able to recover from strategic setbacks – will choose the exceptionally able Gen. Nathanael Greene as Gates' replacement. Aug. 16, 1940: Soldiers with the U.S. Army's parachute test platoon begin jumping over Fort Benning, Georgia. The airborne exercise (actually more of an experiment) is the first for the Army. In 2001, Pres. George W. Bush will proclaim "August 16" of each year as National Airborne Day. Aug. 17, 1943: U.S. Army Gen. George Smith Patton Jr. beats his British Army counterpart Gen. Bernard Law Montgomery to the gates of Messina, Sicily, in what Patton had purportedly referred to as "a horse race in which the prestige of the U.S. Army is at stake." According to the Naval Historical Center, "Despite the rational excuse that Royal Navy frigates were not as large and powerful as their American counterparts, the real causes of these outcomes were inspired seamanship and vastly better gunnery. For the rest of the 19th Century, long after the War of 1812 was over, America's Navy was credited with an effectiveness that went well beyond its usually modest size." Aug. 19, 1981: One-hundred-sixty-nine years to the day after the victory over HMS Guerriere, the U.S. Navy – specifically two F-14 Tomcats -- knocks down two Libyan Su-22 fighters over the Gulf of Sidra. Aug. 21, 1863: Confederate guerillas under the command of William Clark Quantrill (operating outside of the control of regular Confederate forces) launch a bloody raid on Lawrence, Kansas. Quantrill – who purportedly once served in the Missouri State Guard – is widely considered a brigand and a cutthroat. That reputation continues today. To some, however, he remains a folk hero. Aug. 21, 1942: Just after 3:00 a.m., "Banzai"-screaming Japanese assault forces – primarily members of the elite Japanese Special Naval Landing forces – attack U.S. Marine positions on Guadalcanal in what will become known as the Battle of the Tenaru River. The first wave is momentarily slowed as the Japanese struggle to get through the Marines' barbed wire and American rifle machinegun fire rip into their ranks. At one point, the enemy breaks through and the fighting degrades into a savage hand-to-hand struggle with knives, machetes, swords, rifle butts, and fists. The Marines kill scores and hold their positions. Subsequent Japanese attacks follow, but all are beaten back with heavy losses. Thanks to Ed. I was on the USS Midway in 1972/73 when much of this happened. Very exciting. You may find this video interesting. It starts out with the story of the first MIG shoot down of the Vietnam War done by Fighter Squadron (VF)-21 from the Midway. Then, there is short mention of a major overhaul of the ship, after which there is the story of two MIG shoot down events by VF-161 of the Midway in the early 1970s. I was on the staff of the air wing commander (CVW-5) on the ship then, and I knew the pilots and RIOs from VF-161 who describe their actions in the video. One of the events was the last shoot down of a MIG in that war. I saw the video for the first time yesterday and was pleasantly surprised to see their faces and hear those stories that were repeated often on the ship at the time. Exciting times on the boat. The animation in the video isn't all that good, but the story is very good. One of the F4s that is displayed on the ship now commemorates the first and last MIG shoot downs of the Vietnam War. One side is painted with VF-21 markings, and the other with VF-161 markings. I was in VF-161 once too. I joined them when they formed up at NAS Cecil Field, FL in 1960 and made two deployments with them on the USS Oriskany. That is when they had the F3H Demon. … eating dinner, and WHAM! SHOWS HOW IMPORTANT IT IS ALWAYS BE READY FOR A SURPRISE WHEN FISHING!! KIDS OF ALL AGES WILL LEARN FROM WATCHING THIS VIDEO. Thanks to Dutch R. There are masses of garbage in the oceans that cover many miles. 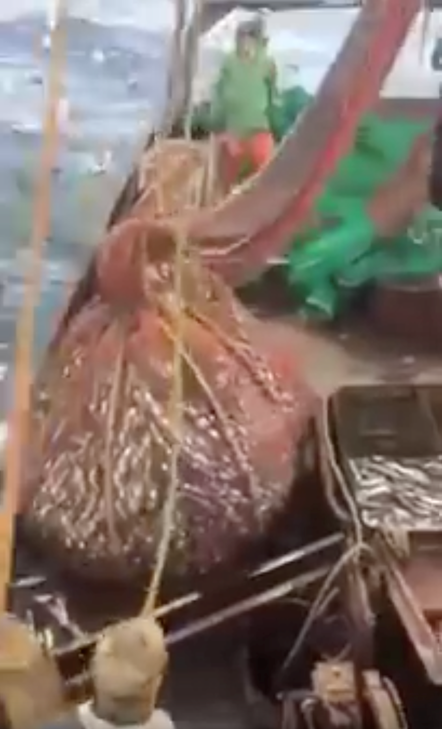 There are many videos of folks on large and small yachts that have video of the extent of this environmental disaster. I lived in the Philippines some years ago - and, from that experience unfortunately, this is not a surprise. Manila Bay was then a cesspool like too many of the waterways. Vietnam was the same, as was a great deal of south east Asia, with Singapore being the notable exception. When we lived on the boat in the Bahamas we found trash almost everywhere - the few exceptions being a very few of the inhabited cays on the northern edge of Little Bahama Bank. The Little Bahama Bank is a beauty spot, many tiny islands (cays) - some inhabited, many not. Throughout there were mangroves - and all too often those mangroves were choked with debris, mainly plastic bags and bottles, cups, etc. On one dive near a northern cay I went into a cloud of plastic - mainly bottles that filled a 'hole' that was easily 100 yds in diameter from a depth of about 40 feet until bottom at 80 feet - the plastic was so dense it cut out the sunlight - I could not see the bottom until I put my face down about one foot from it. A disgusting wave of swirling garbage was captured on video by a college student in Manila Bay. Massive waves of swirling, disgusting garbage were captured on video by a college student in Manila Bay. Piles of trash, plastic bottles and other unidentifiable refuse can be seen rippling and crashing ashore in video and images posted on social media. 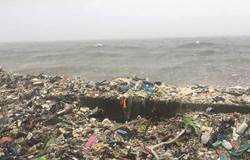 Matthew Doming, a student affiliated with the Bedan Environmental Philosophers Organization, which was leading an effort to clean up the Philippines capital waterfront, recorded video of the trash-filled waves. Doming told Storyful it was the group's first time witnessing the extent of garbage pollution in the area. "It was such a horrible scene but instead of being dismayed, they were motivated to serve in line with the mission of our club, despite the discomfort," he said. Piles of garbage and all kinds of plastic debris have washed up on roads and side streets in Manila following a deluge of rain over the weekend. According to a report from Ocean Conservancy, five Asian countries—China, Indonesia, Philippines, Thailand and Vietnam—are dumping more plastic into the oceans than the rest of the world combined. Residents in some areas have reportedly been pitching in to recover lost valuables and useful material from the debris piles. Don't know if this is all true but I suspect it is pretty close!!! "There are only two who have died for you, Jesus Christ and the US Military. One to save your soul, the other to protect your freedom." Some time ago, Iran's Supreme Leader Grand Ayatollah Ali Khamenei urged the Muslim World to boycott anything and everything that originates with the Jewish people. "Any Muslim who has Syphilis must not be cured by Salvarsan discovered by a Jew, Dr. Ehrlich. He should not even try to find out whether he has Syphilis, because the Wasserman Test is the discovery of a Jew. If a Muslim suspects that he has Gonorrhea, he must not seek diagnosis, because he will be using the method of a Jew named Neissner. "Muslims should be ready to die in great numbers and must not permit treatment of ear and brain damage, work of Jewish Nobel Prize winner, Robert Baram. "In short, good and loyal Muslims properly and fittingly should remain afflicted with Syphilis, Gonorrhea, Heart Disease, Headaches, Typhus, Diabetes, Mental Disorders, Polio Convulsions and Tuberculosis and be proud to obey the Islamic boycott.."
Oh, and by the way, don't call for a doctor on your cell phone because the cell phone was invented in Israel by Jewish engineer Martin "Marty" Cooper . Meanwhile I ask, what medical contributions to the world have the Muslims made?" The Global Islamic population is approximately 1,200,000,000; that is ONE BILLION TWO HUNDRED MILLION or 20% of the world's population. The Global Jewish population is approximately 14,000,000; that is FOURTEEN MILLION or about 0.02% of the world's population. The Jews are NOT promoting brainwashing children in military training camps, teaching them how to blow themselves up and cause maximum deaths of Jews and other non-Muslims. There is NOT one single Jew who has destroyed a church.. There is NOT a single Jew who protests by killing people. The Jews don't traffic slaves, nor have leaders calling for Jihad and death to all the Infidels. 'If the Arabs put down their weapons today, there would be no more violence If the Jews put down their weapons today, there would be no more Israel." Benjamin Netanyahu: General Eisenhower warned us. It is a matter of history that when the Supreme Commander of the Allied Forces, General Dwight Eisenhower, found the victims of the death camps he ordered all possible photographs to be taken, and for the German people from surrounding villages to be ushered through the camps and even made to bury the dead. Recently, the UK debated whether to remove The Holocaust from its school curriculum because it 'offends' the Muslim population which claims it never occurred. It is not removed as yet. However, this is a frightening portent of the fear that is gripping the world and how easily each country is giving into it. It is now more than 65 years after the Second World War in Europe ended. Item Number:4 Date: 08/15/2018 KENYA - AL-SHABAAB BLAMED FOR DEADLY BOMBING ON BORDER (AUG 15/DNK) DAILY NATION (KENYA) -- At least three people have been killed and one injured in a roadside bomb attack in northeastern Kenya, reports the Daily Nation (Kenya). A vehicle struck an improvised explosive device believed to have been planted by Al-Shabaab militants in Mandera near the border with Somalia The vehicle was carrying a team of workers that was clearing a road along the security wall. The team would usually have been escorted to the work site but security officers did not accompany them on Monday, said a local official. An investigation has been launched to determine why the contractors were not escorted. In 2015, the Kenyan government announced plans to build a security wall along the border with Somalia following several terrorist attacks in the region. Progress on the wall has been slow, noted the newspaper. Item Number:6 Date: 08/15/2018 NIGERIA - AIR FORCE TARGETS BANDITS IN NORTHWEST (AUG 15/NANIGERIA) NEWS AGENCY OF NIGERIA -- The Nigerian air force says it has killed a number of armed bandits during recent operations in the northwestern Zamfara state, reports the News Agency of Nigeria. From Aug. 9-11, the air force conducted several airstrikes in Sububu Forest, Birnin Magaji and Rugu Forest, the service said on Monday. On Aug. 9, a bandit hideout was discovered in Sububu Forest during ground operations. A combat aircraft was deployed to eliminate militants who were attempting to escape a clearance operation, said an air force spokesman. Another airstrike on Aug. 11 targeted a militant base in Rugu Forest in the eastern part of Zamfara. The base was being used as a logistics staging area for the supply of arms and ammunition to the group. A fighter jet and attack helicopter were dispatched to hit the base, the spokesman said. The air force launched a large-scale air operation on July 31 in an effort to crack down on armed bandits involved in killings, cattle rusting and other illegal activities in the region, noted Xinhua, China's state news agency. Item Number:12 Date: 08/15/2018 USA - LOCKHEED PICKED FOR 2ND HYPERSONICS PROGRAM (AUG 15/DOD) DEPT. OF DEFENSE -- The U.S. Air Force has selected Lockheed Martin for a second hypersonic weapon development program, reports the Dept. of Defense. The deal announced on Monday covers the design, development and testing of the Air-Launched Rapid Response Weapon (ARRW). It has a potential value of up to $480 million. This is the second Air Force hypersonics program that Lockheed has been chosen to conduct. The company is also working on the Hypersonic Conventional Strike Weapon, reported Defense News. The service wants both programs to achieve a flying prototype as soon as possible and is eyeing 2021 for the milestones. The ARRW program is intended to push the envelope using technologies developed by the Air Force and Defense Advanced Research Projects Agency, while the HCSW will use mature technologies that will be integrated for the first time in an air-launched platform, according to an Air Force release. The announcement comes amid growing concerns that China and Russia are moving ahead of the U.S. in the hypersonics field, noted Breaking Defense. Item Number:15 Date: 08/15/2018 VENEZUELA - NATIONAL GUARD OFFICERS AMONG 14 ARRESTED FOR DRONE ATTACK (AUG 15/CNN) CABLE NEWS NETWORK -- Two high-ranking Venezuelan military officers have been detained as part of the investigation into a drone attack against President Nicolas Maduro, reports CNN. On Monday, Maj. Gen. Alejandro Perez and Col. Pedro Javier Zambrano, both of the national guard, appeared in court, said the attorney general. Several other individuals, including opposition lawmaker Juan Requesens, have been accused of taking part in the plot. Fourteen suspects have been jailed as part of the investigation and at least 20 remain at large, reported the Washington Post. Army Gen. Armando Hernandez said that he was detained as part of the investigation. The attorney general's statement did not clarify the reasons behind his arrest. Venezuelan authorities have blamed a conspiracy orchestrated by opposition groups, based in the U.S. and Colombia, for the Aug. 4 attack.